Doc you really should click the link in the post. 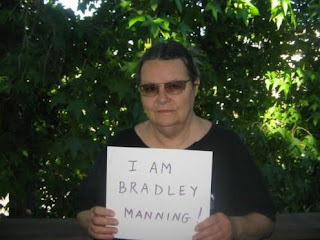 At the site linked there are many different people hold a sign saying they are Bradley Manning. 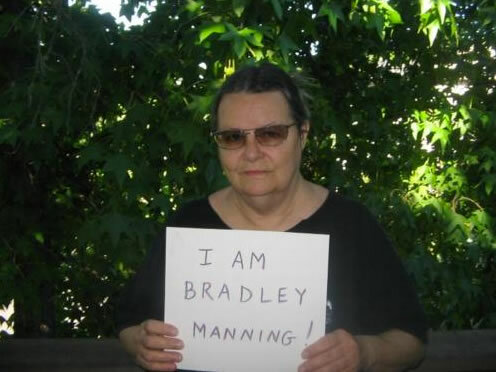 It's a political statement and the people pictured are showing their support for Manning. At any rate it was a great find by Ole JC. Cheers! Thanks Deb but that was just my feeble attempt to be funny. LOL I had just woken up and your humor went completely over my head. 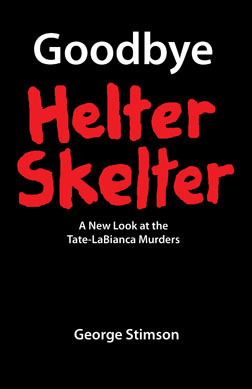 She’s got a sort of ‘Mark David Chapman-esque’ look going there. Perhaps it’s just an aura they cast with those brown tint glasses worn in the shade, along with their lifeless and morose expressions. The type who look like they are on the perpetual cusp of snapping at any moment, but you forget about them until the next time you’re renewing some car registration, stopped at a toll booth, or watching CNN. Hey, I didn't find it. Someone (I am not sure if I should say who) sent it to me. But, still, I was pretty surprised to see it.